Children at Stage 3 Alalay Village of Huajchilla develop close bonds. This is our final post from Bolivia. After a very busy monitoring visit across CFTC-funded projects in Bolivia, Heather Johnston (CFTC’s Director of Programs) and Genevieve Drouin (our Regional Program Manager – Americas) finally take a moment to contemplate what the children they’ve been visiting might wish for, if they could. It has been rewarding for Heather and Genevieve to see that all CFTC partners have demonstrated a steadfast commitment to children’s welfare, and to giving children the very best foundation to build a future on. In addition, in the last part of their visit, all of our Bolivian partners came together as a group to participate in CFTC’s Roadmap to Change sessions, as Genevieve describes below. Both Heather and Genevieve say that there is a wellspring of innovation and enthusiasm within our partners and in our communities in Bolivia. The strength and endurance of their commitment to Bolivia’s children and their families – shown by the many childcare workers who are themselves former residents or clients and by the parents who are involved and contributing to our partners’ work – is inspirational. 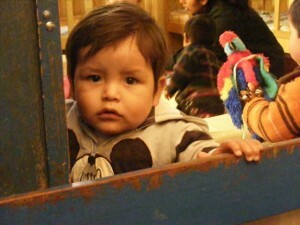 CFTC’s Bolivia partners are poised to come together to make an even bigger difference for children impacted by poverty. All that’s needed is for CFTC and our generous, committed and enthusiastic donors to walk with them on their journey to change. 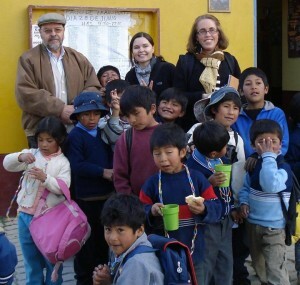 Fernando Diaz Romero, Genevieve Drouin and Heather Johnston (back) with some of the children at SCSJ's centre in La Paz. La Paz, Bolivia, Aug 3, 2012–There is a tradition in Bolivia where you can buy a miniature version of anything your heart may desire, pin it to a doll representing Ekkeko (the Andean god of abundance, money and luck), and your wish will come true. On a Sunday trip to Copacabana, after visiting our partners Sociedad Católica de San José (SCSJ) and Alalay in La Paz, we came across a miniatures market in front of the main church. Anything you could possibly wish for could be found. There were miniature cars, homes, tools, food, clothing, university degrees, babies, money, suitcases and plane tickets, even passports and visas. With the children and their families that our partners support fresh in our minds, we couldn’t help but wonder, what would they choose in miniature if they made a wish? Peeking through the doorway from the playroom at SCSJ Los Lomas. For the children at Alalay, it might be a stable family, a home to call their own, maybe a family meal, or even a visit from a living parent or relative. For the children at SCSJ, it might be regular meals in the home, or a parent who doesn’t work 18 to 24-hour shifts simply to make ends meet. While Ekkeko may not be the one to grant those wishes to the children we serve, our partners work as hard as they possibly can to address those deep-rooted needs and wants, and to approach the child as a whole child, providing for their physical, social, emotional, and learning needs and giving them the best possible start in life. The goal is to give children early in life the developmental support that will allow them to fill their own needs in the future with dignity and grace. And hopefully one day, be in a position to serve the needs of others. 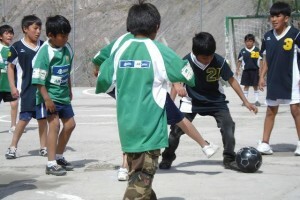 A soccer game in progress at Alalay's Huajchilla Village. Giving back is something that Wilfredo did. Wilfredo once lived on the streets in La Paz, and entered Alalay at a young age. There, he got a good education, later married and now has his own children. 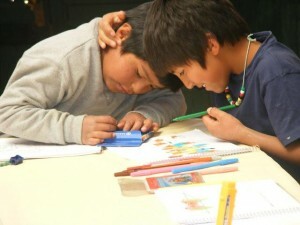 He has returned to Alalay Huajchilla, on the outskirts of La Paz, as an educator and inspiration to the children who are there now. We found him happily coaching soccer to a group of boys when we visited. The smile on his face told the whole story of how much it means to him to give back. The final days of our visit to Bolivia are spent with CFTC partners in CFTC-led Theory of Change (ToC) workshop. As many of you know, ToC is a process used by many social change organizations, and one that CFTC is implementing in all of our countries of operation. Led by the community, the process allows us to identify with greater clarity the change we want to help create, a realistic role that CFTC can play in making that change, and how we can deliver this over the long-term with clear indicators and metrics that we can report back on to donors, to communities and to all of those who are engaged in our work. 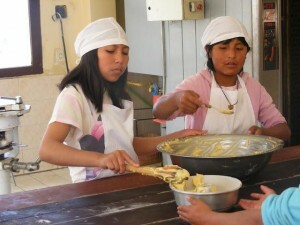 Baking at Alalay Huajchilla - builds skills and confidence for a prosperous future. We began this ToC initiative – which we call CFTC’s Roadmap to Change – in Ghana and Canada in 2011, and Bolivia (along with Ethiopia) is now officially launched. Our goal is sustainable, community-led change – the kind that builds strength and empowerment from within. From what we saw in Bolivia, this goal and our commitment and enthusiasm for reaching it is shared by our Bolivian partners, too. Following the workshop, we will be developing a long-term plan based on the communities’ needs and priorities. That’s it from Bolivia for now! Stay tuned for some new posts from Ethiopia as we roll out our Roadmap to Change in Addis with our Ethiopian partners – along with a very special new blogger – in the next couple of weeks!